Did you know you can connect Direct Mail with Facebook to dramatically improve your chances of generating more high-quality leads? So far in this Direct Mail series, we’ve learned how Personalized URLs (called “PURLs” for short) are the glue that connects print with electronic channels for enhanced results. Want a refresher on how to connect Direct Mail with the web for better results? Go back and listen to Episode 19 “PURLs: Getting Beyond the Hype” and Episode 20 “Secrets of a Direct Mail & Personalized URL Sales Maverick”. If these words are greek to you, not to worry: we break down these concepts into simple, easy-to-understand morsels. By the end of the episode, you’ll know what they mean and how to apply them to your lead generation. But Wait: Facebook Won’t Work For Me! Are you thinking your target audience isn’t on Facebook? … Maybe because you’re a B2B marketer? Here’s why: With Facebook reaching 1.65 Billion users with 1 Billion active every day, your target audience is on Facebook, regardless of who you are targeting. The only challenge is finding them (but with the proper tools, like those we mention in today’s episode, you can do it). If you’re a marketer using direct mail to generate leads, and you’re not considering how Facebook can make your investment return better results, you’re leaving the door open for your competition to figure this out first. Don’t let this happen. If you’re a service provider, like a printer, agency, or other direct marketing company, listen to the techniques described in this episode to incorporate into your customer campaigns. At the very least, bring your clients these ideas and see if you can incorporate one in an upcoming test. You won’t regret it. 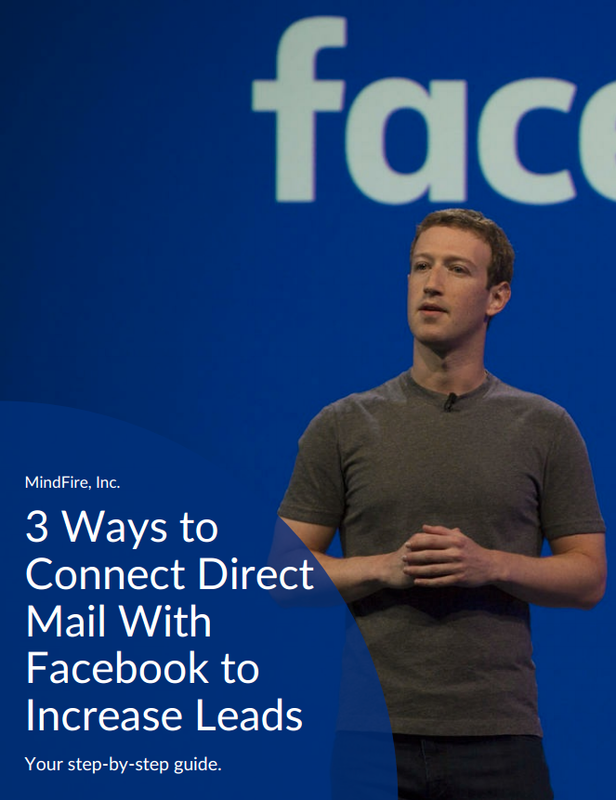 Want Step-by-Step Instructions to Implement Facebook With Direct Mail? Download the complete guide now by clicking below, and you’ll get instructions on how to implement the 3 cutting-edge tactics described in this post and podcast. Want More Modern Marketing Techniques Like Those Shared In This Post? Subscribe on Itunes or Stitcher to the “Pixels & Ink” Podcast.